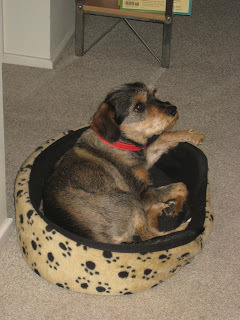 On Monday 2nd November 2009, I got my usual feed of newly listed dogs from Petrescue. A dog called Batman - a cross Miniature Schnauzer and caviler was listed... and he was very cute! So I called up and arranged to meet him that evening. Needless to say we brought him home (a little unprepared) that night! He's now a family member and has met some of the extended family after a car trip to Padstow Heights and to Wattle Grove.